Personally, I think Thanksgiving is the most wonderful time of year. Christmas is great and all, but the pressure around buying gifts can become overwhelming. What I love about Thanksgiving is that the only expectations of the day are focused on football, food and good company. The weather is finally (FINALLY) starting to cool down in Austin. While cooking is my zen place, I know it can be a bit stressful for others not so comfortable in the kitchen. I wanted to do a roundup of my favorite Thanksgiving recipes, and what I do to make them my own. I also wanted to share a few tips to make Thanksgiving Day a breeze and provide inspiration for your menu. Sangria - My summer sangria is just as tasty in the Fall. To warm it up, I add some cinnamon sticks to really bring the Fall flavor. Getting a drink dispenser is such a great investment. They aren't that expensive, and they come in handy throughout the year. Bourbon Iced Spiced Cider - Bourbon purists will not agree with me here, and will suggest you add rum instead. But, I’m not big on whiskey or bourbon straight up. Sorry folks! I was out of rum. I made this drink last weekend and I absolutely loved it. Appetizers should be easy and quick. All of these appetizers can be made the day or night before, which frees up your kitchen the following day for other dishes. These are classic recipes and don't require a lot of prep work. Turkey Brine - Brining your turkey is by far the easiest way to ensure you don’t dry it out. I’ve brined my bird for years now, and the flavor difference is worth the extra preparation. The great thing about brine is that you can make it your own based on the flavors you like. The brine I’ve linked above is what I plan to use this year. Also, don't be scared of the salt. It seems like a lot but your turkey gets a bath before it goes in the oven. I highly recommend getting an oven thermometer. It's the only way to truly know when your turkey is fully cooked. Is it even Thanksgiving without sides? I feel like sometimes sides steal the show - which is okay by me. I wait all year for stuffing. :) I think it’s good to have a mix of veggies and starches. The turkey is already going to put you to sleep, so adding some veggies on your plate won’t kill you. Crock Pot Mac-n-Cheese - I like to do a crockpot version to keep the oven and stovetop free for the turkey and other sides. Kyle is lactose intolerant, so I follow this recipe (like most) very loosely. I omit the tomatoes and the evaporated milk. I use lactose-free whole milk and I also make sure to use lactose-free cheese. And, before you think, “ew, that sounds disgusting”, Boar’s Head makes some delicious naturally lactose-free cheeses. So, it’s not vegan imitation cheese. (Nothing wrong with being vegan, but I hear cheese is tough to replace!) This is real cheese that naturally does not have lactose. Green Bean Casserole - It’s really easy to adapt most recipes to be lactose-free. For this recipe, I just make sure to use lactose-free milk. Making this dish from scratch really makes a difference. And, this is a classic dish that must be on the table for Thanksgiving. Smoky Bacon Biscuit Dressing - I’ve only made the biscuits that are in the original recipe once. Save yourself time and bake off canned biscuits. 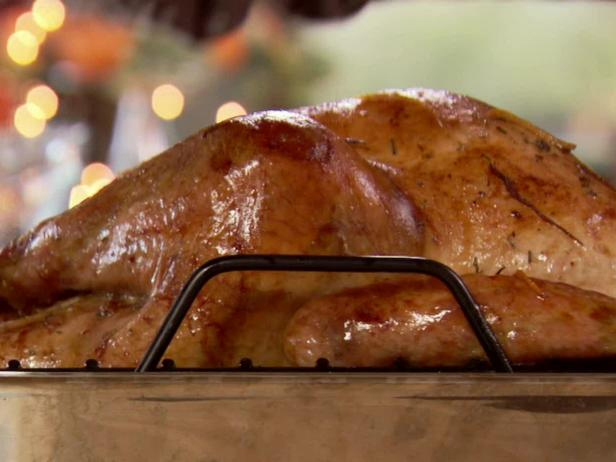 You can assemble this the night before, and throw it in the oven the day of Thanksgiving to bake and heat up. Balsamic Roasted Brussels - I love Brussel sprouts. It’s good to have another green item on your plate, and the balsamic really gives these veggies a special twist. Cream Cheese Pumpkin Pie - I finally found this recipe on a blog! My aunt has made this pie for years and years. I can’t wait to make it. I want to see how closely it resembles her version. The cream cheese layer is made of unicorns and dreams. It pairs perfectly with the smooth layer of pumpkin. Secerectly, I could eat the entire thing myself. Be sure to follow me on Pinterest. I've pinned all the recipes on my Pinterest board. I've also linked to all the recipe owners above, so please be sure to check them out. Cooking should be fun, and the more you put your own twist on things the more comfortable you'll become in the kitchen. I hope everyone has a wonderful Thanksgiving. This year has taught me a lot about patience and what's truly important. I'm grateful for my friends, family, and yoga. Every day I'm focusing on being the best version of myself, so I can give back to all the people who mean so much to me. This Thanksgiving - instead of turning your thoughts to gaining abundance - focus on what is right in front of you. The gifts of the present.